The population growth in the Kent region required environmental improvement schemes to make sure the future population growth of the county can be accommodated. One of these schemes was “Northfleet Growth”. Part of this plan was the construction of a new sewer pipeline from Swanscombe to Northfleet WwTW through a built up area. Inevitably, the pipeline crossed many busy roads. One of these, Stonebridge Road, proved problematic for obtaining a road closure; therefore a trenchless solution was designed and developed for the pipe installation. The road crossing required pumping shafts to be built. Terra intended these to be used as launch and reception shafts for the installation of a guided auger also. The ground through which the pipeline was to be installed was mainly chalk. The installation was required within a tight time frame to allow for the main contractor to meet their programme construction targets and through challenging ground conditions. Terra Solutions constructed the launch & reception shafts using the caisson method. The launch shaft was built with 3.66 caisson rings to a depth of 6m below ground level. For the reception shaft a 2.44m ID caisson shaft was installed again to a depth of 6m below ground level. 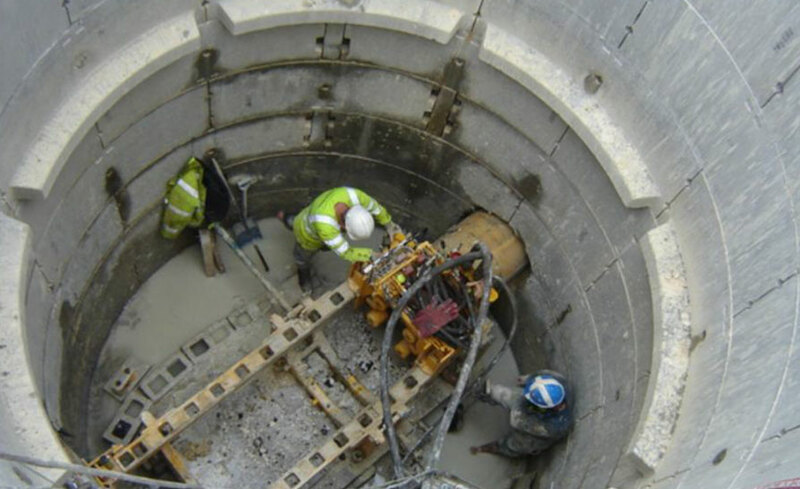 The ground had a high water table and the shafts were installed in the wet and required substantial grout to ensure that they remained water tight for the auger installation. Once the shafts were constructed the Perforator guided auger-boring equipment was set-up according to the required line and level. The installation was over 43m of 600mm vitreous clay pipe. Once this auger-bore installation was complete a new ductile iron pipeline was inserted within the pipeline, grouted in place and capped. Due to the high ground water content the shafts required further grouting and sealing to maintain their water tightness. The guided auger was installed through challenging chalk ground conditions but in accordance with the main contractors programme. See details of our other Auger Boring projects here.